Sometimes when I bring this up with staffers who work at college stations, they get nervous. That’s because college radio is struggling. 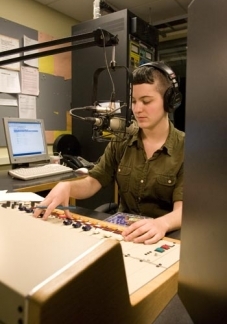 Cash-strapped universities and colleges have been slashing budgets at college FM stations left and right. In the worst cases, they’ve even sold the stations, as was the case for KTRU and KUSF. There’s a fear that colleges will use any increase in operational expenses as an excuse to do away with college stations completely. Like many people, college radio was how I discovered most of the music I love. I spent hours upon hours digging through the stacks of vinyl at KWCW, a free-format college station in Walla Walla Washington, where I worked my way up from a volunteer DJ to News Director to Music Director and eventually, General Manager. It was through KWCW that I learned about the wildly eclectic sounds that make up our nation’s musical heritage, and it was here that I first started booking concerts myself, got to know touring musicians, and got to see the transformative impact that access to community media can have. So I do understand that at a time when college radio is in trouble, it’s important not to make the situation worse. But let’s look at the numbers. The last bill put forward to deal with the issue was the Performance Rights Act, proposed by Senator Patrick Leahy in 2009. One important thing about this bill was that it recognized that college and non-commercial stations play a different role than commercial stations — their public interest mandate is stronger, their budgets are smaller, and their playlists more diverse. So the Performance Rights Act suggested that $500 might be a reasonable annual rate for unlimited use of recorded music ($1000 for college stations whose annual revenues surpassed $100,000). Back at KWCW, we spent twice that much every semester just to print our programming guide! (Edit 4/2016: the new version of the legislation, called the Fair Pay Fair Play act is even more generous, assessing an annual fee of $100). So why are people so worried about a $100 annual fee? Well, it might have something to do with the National Association of Broadcasters (NAB), the lobbying group that represents Clear Channel and the other commercial radio stations. Ever the savvy lobbyists, the NAB mounted a misleading campaign to “Stop the Radio Tax,” claiming that the public performance right would endanger community stations. Of course, this is the same NAB that vigorously opposed attempts to create more opportunities for community FM broadcasting through expanded Low Power FM radio licenses. (And of course, it’s not a tax; the current public performance right exemption is actually a subsidy that primarily benefits the biggest radio companies at artists’ expense). There’s an added benefit. Independent labels have been hit hard by declining sales, and as that’s happened, servicing college radio stations with their newest releases has unfortunately become less of a priority. The possibility to earn back even a small amount of money through performance rights could mean that smaller labels have an incentive to invest a little more in promoting their wares to noncommercial radio. This in turn means it could be easier for your station’s music director to score promo copies of the newest and coolest releases. Musicians, independent labels, and college/community radio stations are ultimately all on the same team. We all want to see a more diverse, vibrant, and independent media ecosystem. A public performance right for over-the-air radio is one step in the right direction.